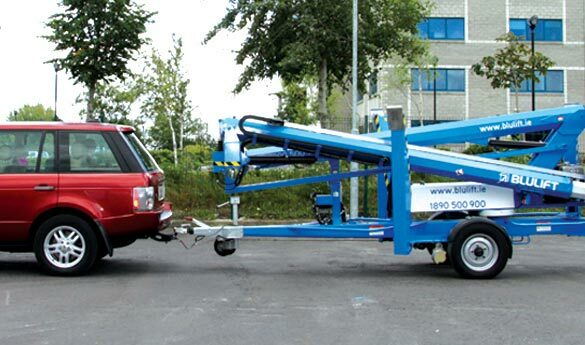 By hiring a Trailerlift from Blulift you can call to our depots and drive away with a trailer lift that allows you safely work at height ranging from 12 meters to 21 metres. They can be towed easily using a passenger vehicle or transit van from site to site and set up quickly using manual or hydraulic outriggers. The Blulift trailer mounted cherry pickers are as light and compact as possible and offers an excellent working envelope for their size. Easy to use proportional controls make operation simple and features such as telescopic booms, jib-booms, platform rotation, traction drive and hydraulic outriggers all help to maximize their effectiveness no matter what the job requirement is. Power options include battery, mains, gas, diesel and ‘Bi-Energy’ (e.g. battery & diesel).